cuwo is an open server implementation for Cube World, written in Python and C++. For years, it was only possible to host PvP servers. But since few days, "matpow2" has finally found the solution, and now it is possible to host stable PvE servers. Two days ago, Wollay uploaded a new Cube World song on his Soundcloud account. As he didn't posted anything about the game since June 2014, everyone started to get excited. Finally, few hours ago, Wollay uploaded another Cube World song on Soundcloud. 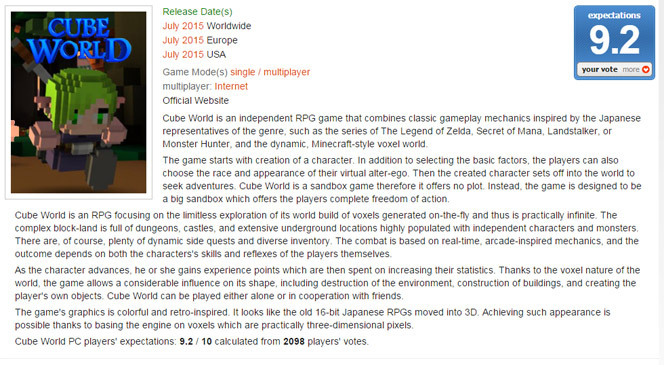 Two websites, not related, have published a very close release date for Cube World. Should we believe this? The problem is that Wollay did not post a single tweet about Cube World since June 2014. But the good news is that the wait to be fixed about this will not be long. Cross your finger!! Should we hope that an update might be released in few weeks? We do hope!! Removing markers from the map, so players need to find the way themselves. But there will be signs. Quest items will be put in a special inventory bag which is shared between players in multiplayer mode. If you find an enemy with a '! ', attack him and you'll get the quest! No need to find a quest giver first. There won't be quest givers. The quests are just there and you need to discover them. However NPCs will give hints. Maximum power is now scaled to 20 (from 100). Effectively, your strength won't be affected, just the numbers are scaled and items are available for a wider level range. Each land now has a power level which determines the average power of creatures and dungeons. That way, players can choose difficulty by themselves. The size of lands has been decreased. The average size is now 20x20 tiles (was 64x64). This enables players to explore new lands more quickly and also results in closer cities. Naming and coloring of creatures and dungeons is now analog to items: For example, a blue "Undead +18" means that he has power level 18 and is likely to drop +18 items of blue quality. In contrast to before, players can now precisely see the power of creatures. Dungeon missions aren't generated daily anymore and aren't adapted to the player level. Instead, players can see on the map if a dungeon has been cleared or not (indicated by a skull icon). A dungeon is cleared by defeating the boss and will remain empty for a couple of days. I'm working on underworld caverns: The idea is to have a network of caverns below the overworld with secret entrances at the surface. The underworld will be inhabited by various monsters of varying power and will add another exploration factor to the game. Currently I'm experimenting with nice-looking entrances (it's tricky to get them right). Besides that I'm working on a better forum/comments solution, but currently the next update has priority. Source: https://picroma.com/blog/post/10]]> Cube World is still in development https://cubeworld-servers.com/blog/6/cube-world-is-still-in-development/ https://cubeworld-servers.com/blog/6/cube-world-is-still-in-development/ Tue, 22 Oct 2013 01:41 CEST Cube World, has posted a good news about the game on Tweeter. Don't be concerned, we're still working on Cube World. We just have a lot of additional work to do at the moment. If you want to make your players vote for your server, we have designed special vote buttons that you can easily add to your website. You will find them on the banners page of your server. After 18 days without a single update, a new version of Cube World is finally available. - You can now reset the day in inns only between 6:00 P.M. and 6:00 A.M.
Why can't we see the number of players connected on a server? Details about the query protocol of Cube World have not been published for the moment. But as soon as we have informations about it, we will finish the query script to be able to display the number of players connected on servers.